When the constraints of work, time, money and life get in the way of international travel, one of my favourite activities is planning an escape of a more domestic kind. I have spent far too many Sunday afternoons plotting weekends in Berrima, Palm Beach and Bowral (to name but a few). All are short drives from Sydney and all are fantastic getaways, and yet, as with so many ambitious weekend plans, they somehow never quite come to fruition. However, recently a combination of tireless campaigning and some kind of mysterious alchemy, I recruited eight friends to go to the Hunter Valley, with the general aim of drinking copious amounts of wine in a picturesque location. More specifically, we planned to attend the highly recommended Pop-Up at Harkham Winery. Getting to the Hunter Valley from Sydney is a wonderfully easy - although, despite the short length, I recommend using any means necessary to avoid sitting in the middle seat, where you will be subjected to your travelling companions spending about three quarters of the trip attempting to sleep on you, and then complaining that your shoulders are uncomfortable. After two hours of truly remarkable singing, a little bit of complaining and one unfortunate m&m related incident, we arrived at Krinklewood Cottage and Train Carriages. 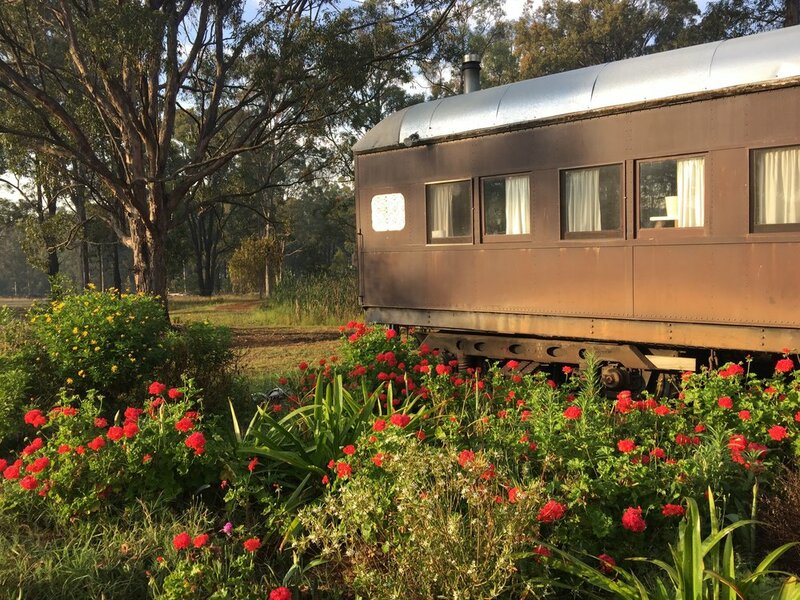 True to its name, guests stay in train carriages that have been so beautifully restored that upon arrival one member of our group announced that she felt like Anna Karenina and another proclaimed that he felt like he was in an Agatha Christie novel. Both were slightly morbid references, but I think they were referring to the opulent and luxurious trains in those books and not the murders and suicides. Moving swiftly along, we stayed in the Victorian Carriage which has a particularly wonderful veranda looking out over the expansive and very picturesque property. It was also equipped with a barbeque, which quickly became the source of great excitement. We spent a leisurely afternoon eating perfectly cooked sausages and taking in the scenery, before getting ready to go to our wine tasting that evening, for which the dress code was obviously ‘country chic’. While there are plenty of fabulous looking wineries within walking distance of our train carriage, we decided to stay on task and ordered a taxi to take us to Harkham Winery, which was about ten minutes away. I should admit, I was vaguely concerned that a wine tasting might be a rather serious affair, which would be completely wasted on my decidedly unrefined palette, and that I would be forced to awkwardly invent adjectives for the taste of wine - 'the distinct aroma of a country walk with just a hint of wet dog'. My fears disappeared quickly when I arrived and was struck by a palpable sense of fun. We were greeted with a tongue in cheek neon sign, and abundance of very cool murals and were regaled with a story of a group of nuns who had come for a tasting earlier that day. It probably goes without saying that our tasting was a light-hearted and delicious affair. Even better, the Harkham wines are organic, which means they are also healthy and you should feel absolutely no guilt about drinking large quantities (this may not be scientifically correct). From the tasting, we went to the Pop Up which featured live music, amazing views over the Hunter Valley and truly delicious Mexican food. Smashing our own guacamole was a particularly appealing feature, as it gave us the feeling of accomplishment that accompanies making your own food, without us actually having to make our own food. After an evening (let’s be honest, an entire day) of indulgence we decided it was time for some cardio. So, for health reasons we left our very cosy sport at the Pop Up and finished the night by invading the dance floor at Harrigans Irish Pub. In the early hours of the morning we found one wayward member of our group who had befriended a bride-to-be in the ladies room, fought off a crowd for a taxi and snuggled into our train carriage for the night. We were very sorry to be leaving the following day, particularly because we barely scratched the surface of the plethora of activities the Hunter Valley has to offer. The car ride on the way home included only a tiny bit of complaining (surely it’s against the rules of road tripping to put the same person in the middle seat on the way there and back), and a lot of brainstorming for our next trip. We returned to Sydney with the conviction that a weekend away in the Australian countryside is a surprisingly easy and enjoyable antidote to wanderlust.